The dale sweeping into the distance on a glorious Spring day; Gunnerside nestled in the calm of the dale floor; a gentle light playing on a shadowed daleside; the pattern of ancient and modern enclosures; the iconic barns that fleck the fieldscape; seemingly a timeless place that soothes the soul and serves as a refuge from the deafening cacaphony of life today in its maddening political turbulence. 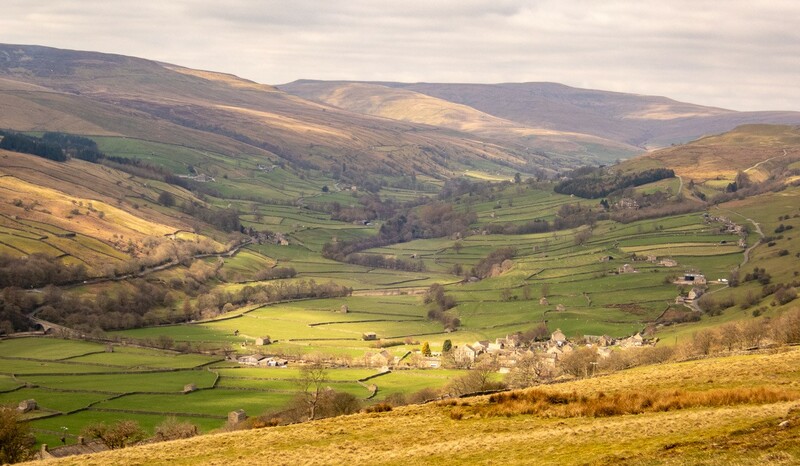 It is little wonder that Swaledale has been described by one travel writer as one the his top twenty "must visit" places in the world. That does not surprise me nor would it have surprised Geoff. The pictures (courtesy of Trevor Thurlow) need no further words. They include his brother and friends meandering their way through a landscape redolent with memory of the good times in Geoff's presence.